You already know that Hawaii is famous for its sandy white beaches and ocean views, but we bet you didn’t know about Kauai – Hawaii’s northernmost island. Labeled “The Garden Island”, our tropical paradise is home to breathtaking scenery, amazing outdoor activities, and world-class accommodations. 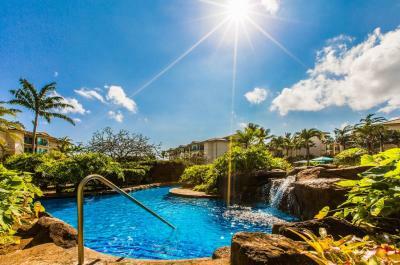 When you choose one of our garden or mountain view vacation rentals at the Waipouli Beach Resort, you’ll have breathtaking views of the island’s awe-inspiring lush tropical landscaping and summits and lush tropical forests. Plus, you’ll enjoy all the other benefits that come with being our guest! Our resort condo rental properties offer amenities like comfy furnishings, exquisite hardwood accents, and comfortable beds. You’ll enjoy your fully-equipped kitchen, where you can prepare anything from a quick snack to a seven-course meal using chef-designed appliances. Outdoor shared gas grills are available as well. If TV is your thing, then you’ll love the flat panel televisions with an assortment of stations to enjoy. And, of course, you’ll have high-speed Internet access! A great selection of recreational activities from which to choose. Swim in the sapphire waters of our two-acre pool. Enjoy a drink at the tropical beachfront bar. Play golf on one of the world-class courses that are only minutes away. Relax in a padded chaise lounge alongside the pool. Hear the sound of crashing waves, and feel the cool touch of Pacific Ocean breezes, as they melt away your worries. We even have water slides, scenic waterfalls, and a kid’s pool with its own sandy beach for your family’s pleasure. 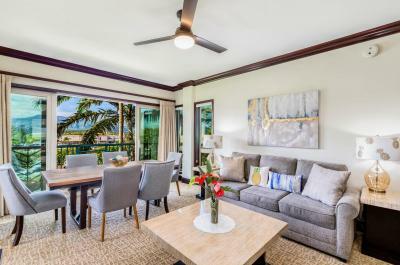 While you’re enjoying the scenic beauty from your Kauai beach resort condo rental, you can sample some of the finest cuisines found anywhere. Dine in the area’s many outstanding Kauai restaurants. Get a cup of coffee. From exotic gourmet meals to casual snacks, it’s all at your fingertips. Our facilities are non-smoking for our guests’ comfort and enjoyment. 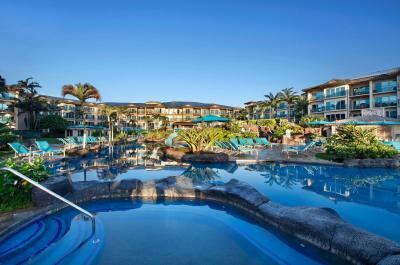 Luxury Waipouli Beach Resort vacation condo rentals reservations are limited, so call today. Our friendly customer service specialists will gladly assist you. Learn more or reserve your vacation home online by contacting us. We look forward to welcoming you to paradise.